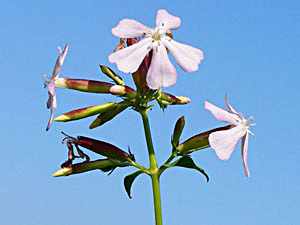 Soapwort's main medicinal use is as an expectorant. Its strongly irritant action within the gut is thought to stimulate the cough reflex and increase the production of a more fluid mucus within the respiratory passages. The whole plant, but especially the root, is alterative, antiscrophulatic, cholagogue, depurative, diaphoretic, mildly diuretic, expectorant, purgative, sternutatory and tonic. A decoction of the whole plant can be applied externally to treat itchy skin. 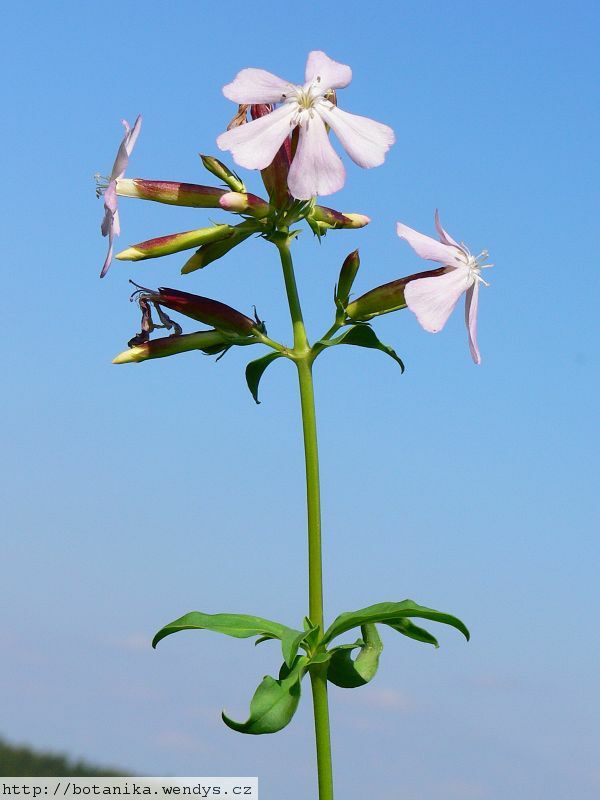 The plant has proved of use in the treatment of jaundice and other visceral obstructions, but is rarely used internally in modern herbalism due to its irritant effect on the digestive system. When taken in excess, it destroys red blood cells and causes paralysis of the vasomotor centre. See also the notes above on toxicity. The root is harvested in the spring and can be dried for later use. One of the saponins in this plant is proving of interest in the treatment of cancer, it is cytotoxic to the Walker Carcinoma in vitro. Fields, roadsides and along the banks of streams. A soap can be obtained by boiling the whole plant (but especially the root) in water. It is a gentle effective cleaner, used especially on delicate fabrics that can be harmed by modern synthetic soaps (it has been used to clean the Bayeaux tapestry). It effects a lustre in the fabric. The best soap is obtained by infusing the plant in warm water. The roots can be dried and stored for later use. The plant is sometimes recommended as a hair shampoo, though it can cause eye irritations. The plant spreads vigorously and can be used as a ground cover when planted about 1 metre apart each way. Seed - best if given a short cold stratification. Sow autumn or late winter in a cold frame. The seed usually germinates within 4 weeks. Prick out the seedlings into individual pots when they are large enough to handle and plant them out in early summer. Division in spring or autumn. Very easy, it can be successfully done at any time in the growing season if the plants are kept moist until they are re-established. Larger divisions can be planted out direct into their permanent positions. We have found it best to pot up the smaller divisions and grow them on in a lightly shaded position in a cold frame, planting them out once they are well established in the summer. The plant contains saponins. Although toxic, these substances are very poorly absorbed by the body and so tend to pass through without causing harm. They are also broken down by thorough cooking. Saponins are found in many plants, including several that are often used for food, such as certain beans. It is advisable not to eat large quantities of food that contain saponins. Saponins are much more toxic to some creatures, such as fish, and hunting tribes have traditionally put large quantities of them in streams, lakes etc in order to stupefy or kill the fish.